Mogok rubies of greater than three-carat size. Jewelry is made as a result of a conception that specially states, “This is what we want to make.” In the case of a single gemstone, experience will provide a good idea of what kind of material is available, even if it is not on hand. Eventually the material will be found, making it possible to create the jewelry as it was planned. However, trying to bring together the eleven rubies in this necklace and earring set would be an impossible feat. This kind of special jewelry requires having the stones first, then thinking of a design that makes use of them. With these rubies in hand, the designer made the decision not to accompany them with round brilliant cuts, instead choosing to make the rubies rise up from among white pear-shape and marquise diamonds. 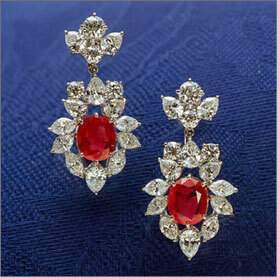 Though basic, the rubies are used effectively in this effort to bring out the splendor of magnificent jewelry. Around 1990, there were ten-carat-size rubies from the Mogok region of Myanmar selling at auction for prices in excess of $1.5 million. This is triple the price for similarly sized diamonds, and shows how rare and limited in mining production high-quality rubies are. It is especially rare to bring together Mogok rubies of three-carat size like the ones seen in this necklace and earring set. It is unknown whether these eleven pieces were removed from the same mine at the same time, or if they were collected slowly over a long period of time. Because a necklace needs to lie comfortably and be flexible while still having sufficient durability, it must be made precisely, with extra care given to the finer details. The superiority of the smallest details shines through and becomes part of this jewelry’s character. No doubt the process of creation included placing the gemstones in clay to decide the layout and angles by trial and error, followed by fabricating the actual platinum components, and finally linking the parts and setting the stones. The earrings below match this necklace.